Some of our best digital preservation projects have been the direct result of collaboration; working with dozens of separate entities that all have valuable materials that they want to share with the online world. That collaboration brings some challenges though, and one of biggest problems we’ve run into has been how people name files after they’ve created or digitized them. 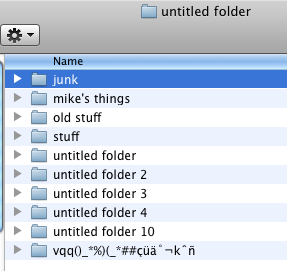 For experienced computer users who store lots of valuable informartion digitally, it goes without saying that clearly naming files is extremely important. Often, the filename is the first thing a user sees that identifies what’s in a file; the information it contains. Without any other cataloging system in place, file names become the way to figure out what’s inside the hundreds of thousands of individual files that can sit on the average persons’ desktop computer, and having countless “untitled” or ambiguously-named files can make finding the information you want nearly impossible. Fortunately, modern computer operating systems give people a wide latitude in how they can name files. Most people have a file naming method that works best for them, and for the most part, individual systems can work well, so long as they stay consistent and aren’t too hard for most people to easily comprehend. However, things can get a bit more tricky when such files are destined for a digital library, online repository, or other type of internet-based storage and delivery medium. When these types of architectures come into play, some of that wide latitude that modern computers give us in naming files can cause some complications. Web-based content management systems aren’t always as flexible or forgiving with filenames, and can sometimes reject or even mangle files that are more liberally-named. For this reason, it’s helpful to establish and follow a few simple ground rules when working on a digital preservation project that requires file handling.